The value of a Henri Bourassa, 1868-1952 - 5 cents 1968 stamp depends on several factors such as quality and wear, supply and demand, rarity, finish and more. Values in the section are based on the market, trends, auctions and recognized books, publications and catalogs. This section also includes information on errors and varieties and characteristics. 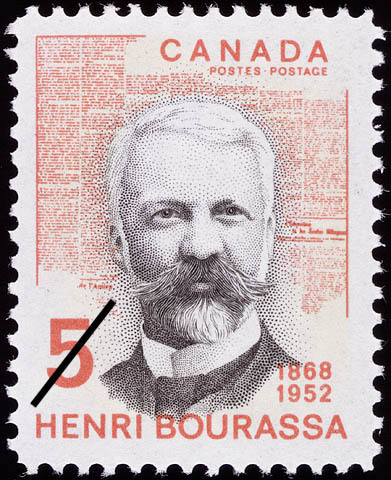 The accomplishments of one of Canada's most colourful public figures and intellectuals are recalled by a stamp commemorating the 100th anniversary of the year in which Henri Bourassa was born. Bourassa was born at Montreal September 1, 1868. He was perhaps the first prominent politician to openly favour the establishment of Canada as a completely independent nation under the Crown. A man whose mother tongue was French, he achieved complete mastery of the English language and his adaptability to the two was put to effective use with brillant skill in his authorship of numerous pamphlets and books supporting his political leanings. As a fiery orator he is regarded to have reached the pinnacle of his power in the early 1900's; with his personal magnetism and mastery of his subject he would hold the undivided attention of audiences of thousands for hours. It has been said of Bourassa that he could never have adapted to leadership of a political party because he would readily have sacrificed power or the party interest for a personal principle. The passionate political beliefs of Bourassa were awakened during the period in which he was completing his formal education at the age of 17. He had left Montreal to manage lands inherited through his Papineau ancestry; the location was Montebello near the Quebec-Ontario border, midway between Ottawa and Montreal, where he was to be elected mayor at the age of 21. He entered the federal House of Commons as representative for the same area in 1896; resigning in 1899 he was promptly re-elected by acclamation. In 1907 he again retired from federal politics in order to contest a seat in a provincial election; defeated in this contest, he subsequently won election in 1908. in 1925 he returned to the federal scene for another ten years as the representative for Labelle. As a journalist, Bourassa, a prolific writer, left a legacy to the nation in the form of a highly respected Montreal French language newspaper Le Devoir which he founded in 1910. His personal involvement in subsequent years was as co-owner and Editor-in-Chief. Through the early days of Le Devoir it was recognized as a journal of the intelligentzia; it was through these, however, that it gained an influential position in French Canadian journalism. Earlier in life, Bourassa had been a contributor to the columns of Le Nationaliste, a Montreal journal, and had been editor and owner of l'Interprète published in Clarence Creek, Ontario. An examination of Bourassa's approach provides an insight into his own interpretation of the designation "Nationalist" by which he was known. He did not subscribed to the concept of one French province with the remainder as English. It was his hope there would be a spread of French-speaking persons throughout Canada to create areas of their own culture and language. He visualized the existence of such areas in Western Canada as creating a double mentality which would server as a unifying force from coast to coast. Historians provide many examples of the controversial nature, the unpredictability and the contradictions of this man. Death came on August 31, 1952, the eve of Bourassa's birthday.